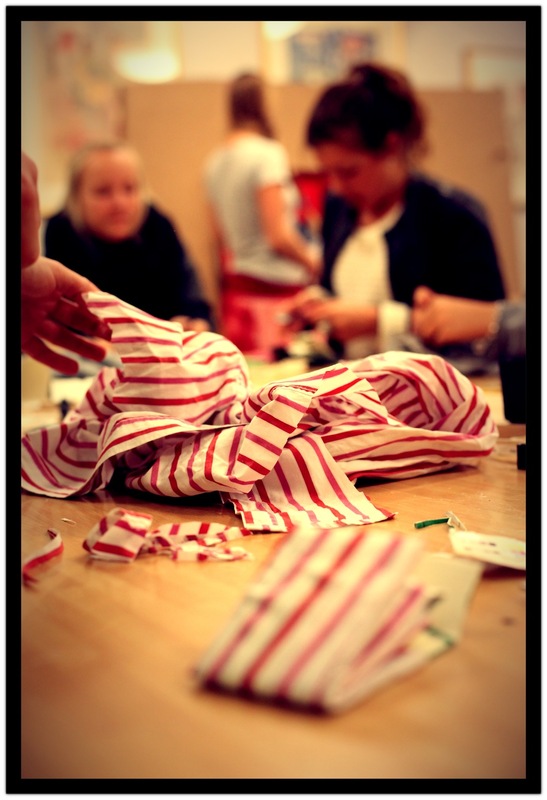 These last two days we’ve had some very inspiring workshop sessions with ninth graders in Nynäshamn, Sweden. We spent two very intense hours of understanding the journey of our garments, idea generating, self fulfilment, following our dreams, inspiration, social entrepreneurship and upcycling! The students upcycled their used milk cartons into gorgeous wallets. We held workshops in three different schools, and met around 120 students. We were astounded by some of the sharp ideas generated during these sessions. A waste reducing idea was to skip all the use once packaging, and instead go back to the good old milk bottles, corn bottles, anything bottles. So each supermarket buys a product in a bulk, and we as costumers simply refill our own containers! A lot of the teens loved to work out, so why not take advantage of all the energy created by people running, dancing and cycling, to generate the electricity of the gym itself, and perhaps neighboring facilities! Many of the students are also fond of fashion (like us! ), but were astounded at the amount of water used to produce a pair of jeans, and the amount of chemicals used in the production process. Therefore they want to see a legislation where all the ingredients should be explicitly detailed on each garment. These were just a few our of many astounding ideas! Oh, and never forget – Sabcuch milega, Everything is possible!